Years ago I had a friend I sometimes looked to for counsel. He was a few years older than me and had already blazed the trail from hippie to the not-really-expected condition of being a family man with a mortgage and responsibilities. Holding to his ideals even as he cut his hair and put on a suit, he got a masters in psychology and became director of a drug and alcohol treatment center in northern California. From the many discussions we had, I remember most clearly his phrase, “the seemingly bad.” He meant that we cannot really evaluate events as they unfold, and we waste a lot of energy trying. Years later I came upon a Chinese folktale that serves as a parable of the point. 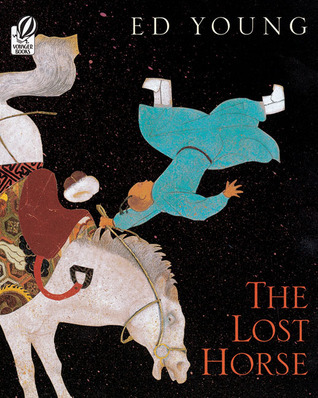 It goes by various names, such as “An Old Man Finds a Horse.” An illustrated children’s version of the tale was published by Ed Young and Tracey Adams in 1998 as, The Lost Horse. Here is the gist of the story. A short time later a regiment marched through the valley, pressing all the young men into military service – except the old man’s son, who was unable to serve in the infantry because of his leg. The other young men who marched to war never came home. I had my own experience of “the seemingly bad” in the early ’80’s. I worked as a part-time community college art instructor and wanted a full time position. Shasta College, in Weed, CA, right at the foot of Mt. Shasta, had an opening, and based on an application and phone interview, I was invited to visit the school as one of five candidates for a second interview. Everything looked good. My portfolio was strong, and I got a glowing recommendation from the chairman of the art department where I had studied, who had also taught the hiring professor at Shasta. Mary and I drove up on the kind of fall weekend that makes you glad to be alive. The interview went well, and that night we celebrated with dinner at a restaurant that featured a balcony overlooking a creek. While watching a golden sunset, we talked about where to live and what to do in our new home. They promoted one of their own part-timers. I’m sure they intended this all along, and the interviews were just a formality to satisfy labor regulations. I was crushed. I forgot my old friend’s lesson, that this might just be seemingly bad. A year later, in the face of recession and severe budget cuts, the position I had applied for was cut, along with a number of other teaching jobs. If I had been hired, we would have been stuck in a small town with severe unemployment. This story and the concept of “seemingly bad” came to mind recently when I thought of people I’ve met who are desperate to get published – not just working hard to achieve the goal, but desperate, piling all their hopes and sense of worth on that increasingly shaky endeavor. What happens to the many who will never achieve that goal? Hopefully, something along the lines of what happened after Shasta College turned me down. Feeling at first like a sell-out, I went to work in computer graphics. In retrospect, it was a great move. What seemed bad turned me down a different road that allowed me to make a good living while exploring a different kind of creativity. I’m not suggesting that bad things don’t happen, or every cloud has a silver lining. The seemingly bad can be awfully hard to weather. I am suggesting that it’s hard to anticipate outcomes from the middle of the trenches. The more I thought about it, the better it seemed to pass on my old friend’s advice. The seemingly good and seemingly bad are often not what they seem. This entry was posted in Folklore, Miscellaneous, Stories and tagged folklore, Miscellaneous, Musings, stories. Bookmark the permalink. Morgan, what an excellent post and the reality of the lesson is often times lost in our microwave mentalities. It is good to be reminded of this truth, Thank you. Thanks for reading and commenting, JT. Posted on FB. I continue to love your reflections on folk tales & their wisdom. Thank you for that post. I am having a Shasta moment here and am now thinking maybe there is something better down the line for me. I hope the post and the story help. The hard thing about navigating uncharted waters is that the strategies that worked in the past are probably not what’s demanded in new situations. I always loved that detail from the Narnia books – the wardrobe only works once. Next time they have to find another way in. Certainly trust/faith is important and wisdom tales like this one always help me. Thanks for this, Morgan. It’s an excellent reminder – and now that I have the folktale in mind, it might just stay in my brain. The story probably will stick with you. I’m sure that’s why so many great teachers have used parables and wisdom tales – they don’t want their disciples nodding off during a lecture.. The Lost Horse is exactly what I need to include in my classroom when we talk about writing persuasions — it can be too easy to assume if one thing is good then the opposite must be bad. It’s good to have a reminder that each claim depends on context and consequences. I think along these lines too. I enjoyed the article. Anyway, the idea was to look at one of the worst situations you’ve experience in your life, and to try to find something good that came as a result of it. Obviously it’s something that can’t be done in relative proximity to the event, but it’s something that can easily be done with a couple years of hindsight. Another wonderful post Morgan, thank you again for sharing this. I did not want to presume to comment on “the worst” events people can experience, though I think we do find over time that we grow more from overcoming difficulties than when everything is just flowing along. I think it is all to the good when we can find we have gained strength when the chips were down. The image that comes to mind is tempering steel in the fire. Thanks for your comment.